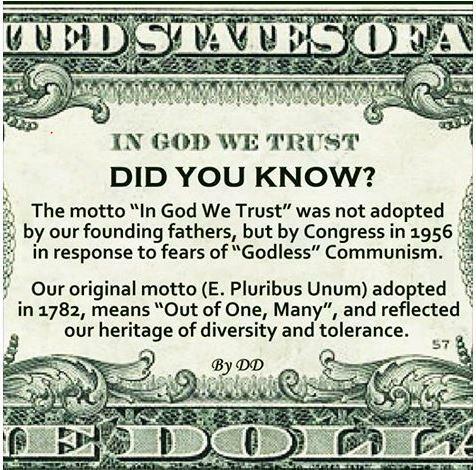 This entry was posted in Facts & Statistics, Hunger & Poverty, News & Views and tagged 1782, communism, Congress, diversity, E. Pluribus Unum, heritage, in God we trust, motto, tolererance on June 23, 2015 by Ray Buchanan. Yesterday, I had the opportunity to speak to the San Diego Downtown Rotary Breakfast Club. Even though it meant getting up at 0530 and hailing a taxi at 0630 on yet another unseasonably cold Southern California morning, the meeting was well worth the effort. I was immediately impressed with the wonderful diversity of the club. There was a good mix of ages among the 100 or so members present, with a good number of younger members. And if the gender balance wasn’t 50/50 it was close. There were also a surprising number of newer members, as well. But what was most impressive was the warmth and general friendliness of the club. Even at 0700 on a cold morning it was obvious that everyone was glad to be at their Rotary Club and everyone was genuinely pleased to see each other. The relaxed banter and good-natured kidding added to the warmth and evident camaraderie. The meeting was spirited and well run, with good, solid leadership. There was a full agenda, but it was packed with meaningful service-oriented announcements, and everyone had time to share. And as the featured speaker for the morning, not only was I given ample time for my presentation (which doesn’t always happen), there was also plenty of time allotted for questions & answers. I get the opportunity to make more presentations, speeches and talks than I can track. That puts me with and in front of dozens of groups annually. Few of them come up to the level of the San Diego Downtown Rotary Breakfast Club. This is one Rotary Club that deserves recognition. These folks understand “service above self.” They are what Rotary International is all about. This entry was posted in News & Views, Travel Tales and tagged California, diversity, leadership, Rotary International, San Diego, San Diego ROtary Breakfast Club, service above self on January 17, 2013 by ray.